A. Buyse, ´Words of Violence: “Fear Speech,” or How Violent Conflict Escalation Relates to the Freedom of Expression´ (2014) Human Rights Quarterly vol. 36-4, pp. 779-797. B. de Gaay Fortman, ‘Between Principles and Practice: Grotius’ Commitment to Religious Peace in a Contemporary Context’, (2013) in Grotiana (Annual Journal with Brill) Vol. 34, pp. 25–40. S.J. Hollenberg ‘The Security Council’s 1267/1989 Targeted Sanctions Regime and the Use of Confidential Information: A Proposal for Decentralization of Review’ (2015) Leiden Journal of International Law Vol. 28, pp. 49-71. 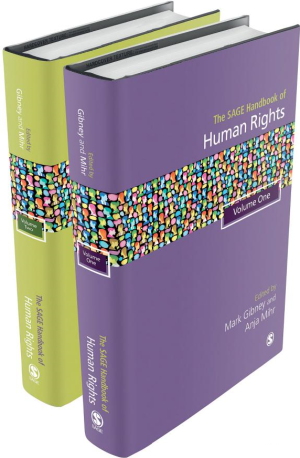 A. Mihr, M. Gibney, The SAGE Handbook of Human Rights (two volume set), California: SAGE Publications, 2014. 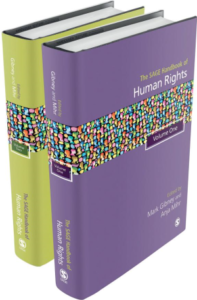 The SAGE Handbook of Human Rights will comprise a two volume set consisting of more than 50 original chapters that clarify and analyze human rights issues of both contemporary and future importance with an inter-disciplinary approach. Furthermore, not only will the Handbook provide an analysis of the discipline that addresses the history and development of human rights standards and its movements, mechanisms and institutions, but it will seek to go beyond this and produce a book that will help lead to prospective thinking.